We’re looking forward to another exciting collaboration at the CSO Spring Concert 2017. 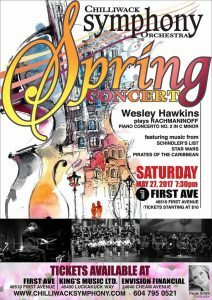 Chilliwack Symphony Orchestra and Chorus will be performing at the First Ave Christian Assembly in Chilliwack on May 27. FVAD Pre-Professional Academy students will be performing to Aaron Copland’s Rodeo in Hoe-Down and Saturday Night Waltz.